Fig. 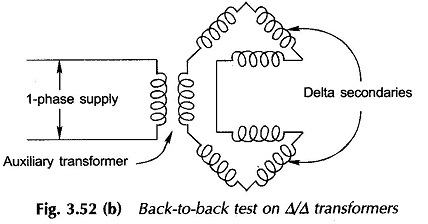 3.52(a) shows the connection arrangement for the Back to Back Test on two identical 3-phase transformers. The two secondaries must be connected in phase opposition and in proper phase sequence. 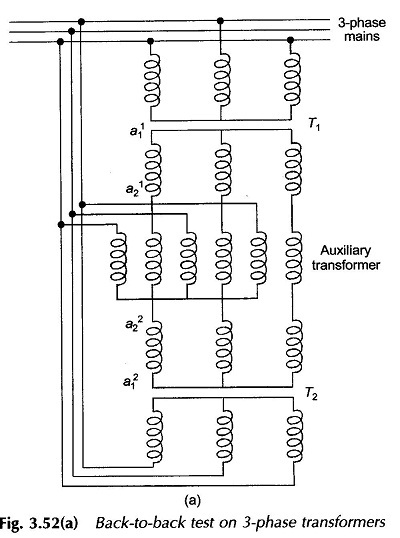 The auxiliary transformer for circulating full-load current is included in the circuit of the two secondaries; it could also be included in the circuit of the primaries. Thus with only losses (core-loss and copper-loss) supplied from the mains, a “heat run” test could be conducted on the transformers. The primaries are normally excited from the mains. Each secondary delta is opened at one junction and a single-phase transformer can be employed to circulate full-load current in both the deltas as shown in Fig. 3.52(b).